So I’m back on the wagon, both with the blog and with the work. I’m not making promises anymore about how often I’ll post here – I’m trying to do my best to surrender to the wack-a-day rhythm that is my life, and just go with it. It’s nice finally to be working on something that isn’t a secret; something I can show to the interwebs! I started this quilt in 2007, I think, or even 2006. Most of the fabrics came from Kaimuki Dry Goods in Hawaii. I visited in January of 2006, and bought half a suitcase of stuff with a vague plan in mind and not much more. I spent months staring at the fabrics before I finally worked up the courage to cut into them, and then made a small amount of progress before my brother and sister-in-law announced their engagement. I very carefully labeled all the pieces and put them away in a box so I could tackle the wedding quilt that would take two years to finish. When that was all over, I hadn’t exactly forgotten about this beauty, but I didn’t have any more quilt in me. Since I have mentally declared 2013 as “The Year of Wrapping Up Loose Ends,” it was with satisfaction but some trepidation that I pulled that box off the shelf a few weeks ago. I’ve made several more quilts in the intervening years, and gotten much better at making the seams line up and the corners pointy. I was worried that I’d look at the old blocks and hate them. Luckily, I have declared the previous work “good enough” and thrown myself back into it, with an even clearer idea of what I want the finished product to look like. 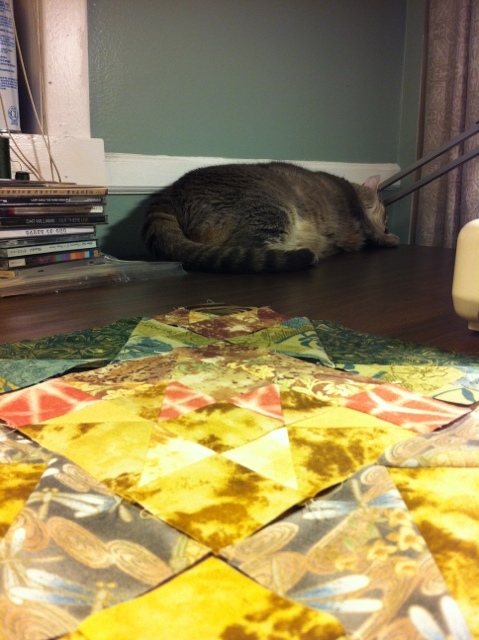 Making a full-sized quilt with a cat around is harder than making a quilt without the cat. Inara loves to help with any project, but I’m having a hard time convincing her that the hot iron is not something she wants to smell and that I really just did wash all that fabric and would like to keep the cat hair content to a minimum. When we can declare a truce, she likes to hang out behind the machine, blessedly out of the way, and snooze. I’ve built four more blocks in the last three weeks, and progress in continuing apace. Ok, yeah, I know. I’ve been gone a long time. A REALLY long time. Like, 6 months long. In my defense, I did throw a wedding. 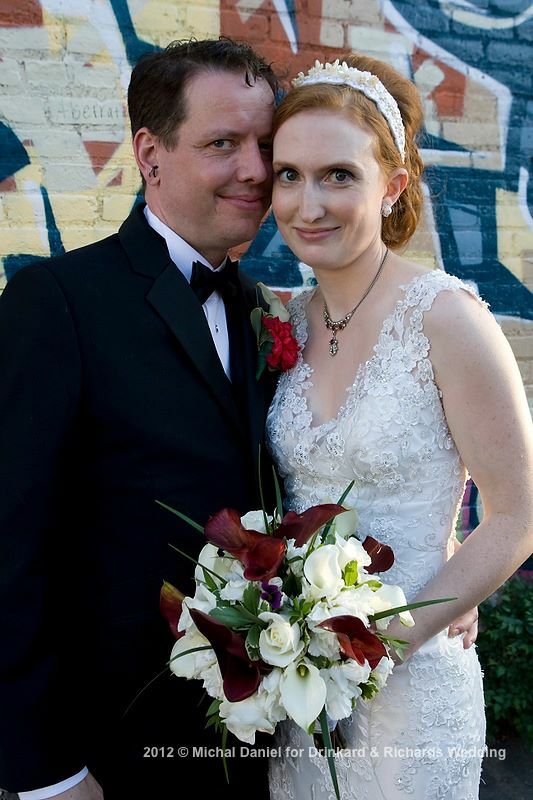 A really lovely wedding. And I worked 60 hours a week all summer long, right up until a week before said wedding. And then we went on a really well-deserved vacation. And then I came back home and teched another show. I’m just now beginning to resurface. There’s been so much happening this year that it’s been hard to have time to do it and write about it. I realize that not writing will never make me a Famous Blogger, and it’s not going to get me invited to fancy parties or to give motivational speeches. I’m hoping to get my groove back in the coming weeks. The husband (still getting used to that!) is a great inspiration – he’s now running a blog of his own. It’s a cool project based on a box of postcards we found in an antique shop in New Orleans – Postcards to Joe. R spends a lot of time wandering down the “Wikipedia hole,” exploring all kinds of topics and getting to know this Joe guy in the process. I spend more time than is strictly good for me surfing Pinterest during shows, and it seems like all the pictures link back to “Happy Housewife” blogs, where pretty women with very white teeth explain how you can clean your oven for three cents using baking soda and a toothbrush, all while home-schooling your five kids and cooking wholesome organic meals from the veggies you grew and canned yourself. Whilst I realized that this is a form of masochistic torture, I can’t look away. It’s captivating. It’s all Martha Stewart-y. Thank God for the Yarn Harlot, who adds a little much-needed perspective. It’s nice to know that there are other women on the internet who accidentally wear their underwear inside out and consider the dining room clean if at least one person can eat at the table. Of course, she’s a jet-setting Famous Blogger, but a girl can dream, can’t she?